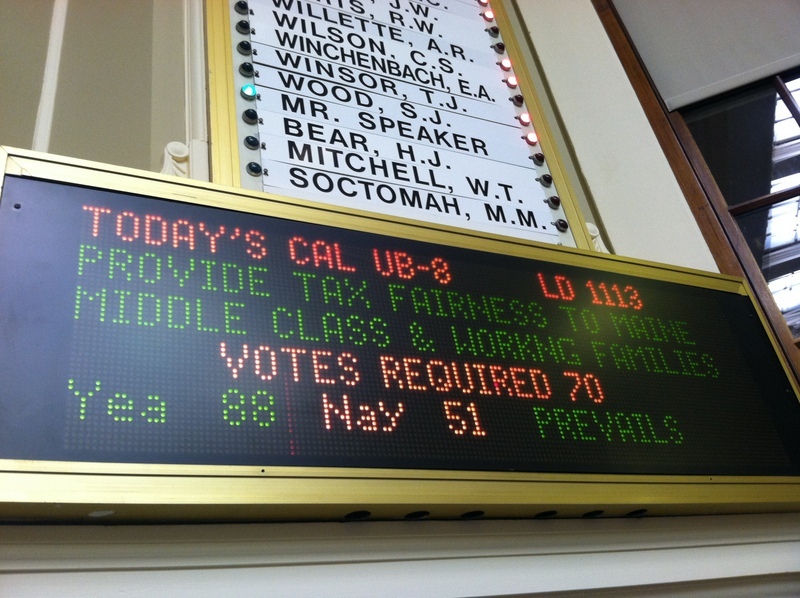 Among the many bills taken up during the last whirlwind that was last week’s legislative session was House Majority Leader Seth Berry’s sponsored LD 1333, “An Act To Provide Tax Fairness to Maine’s Middle Class and Working Families”, aka the Buffett rule bill. 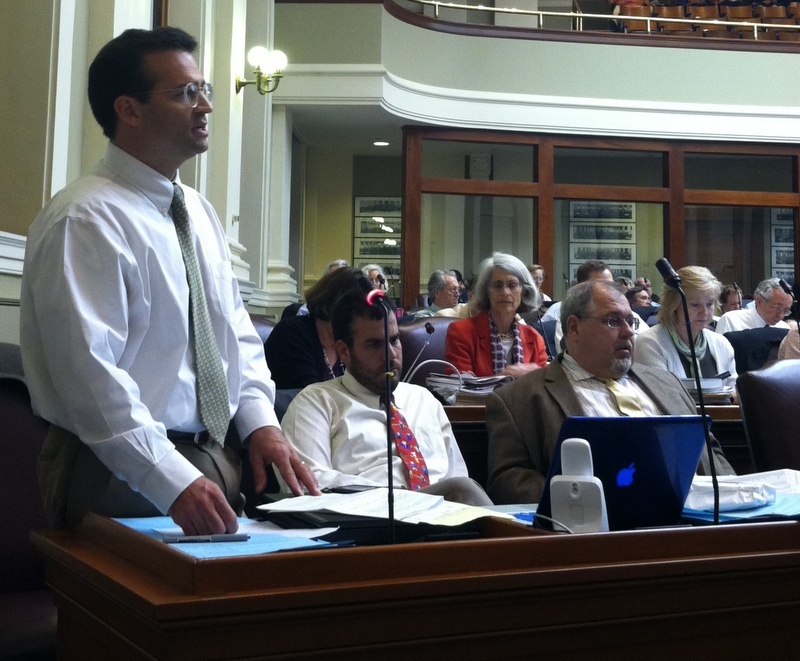 “LD 1113 would apply the logic of the “Buffett Rule” on Maine’s state and local tax code. As you know, the Buffett Rule is a concept named for the wealthy investor Warren Buffet, who famously said his secretary should not be required to pay higher taxes than he pays. According to Maine Revenue Services, Maine’s secretaries- and truck drivers, and child care workers- are now paying higher taxes than their bosses. It is time for this to stop. It is time to reduce taxes on those who pay the most, and equalize them for those paying too little. At present, a mother of two, working full-time at minimum wage, pays, nearly twice as much per dollar of income as a person making $1 million a year. This is due to the regressive nature of property and sales taxes, as well as the “stacking” of income tax credits, exemptions and deductions by a select few. LD 1113 would correct this inequality. Through its credit mechanism, it would actually cut taxes for hundreds of thousands of middle and working class families. More immediately, the bill as amended would fully restore revenue sharing. (NOTE: LD 1113 would have worked in addition to restoring the municipality revenue sharing portion not covered by LD 1509, the biannual budget vetoed by Governor LePage yesterday. ~AP). Does equalization add complexity? Absolutely not. In fact, by simplifying the Circuit Breaker and incorporating it into the tax return, LD 1113 can actually reduce paperwork for hundreds of thousands of families, and add only 3 or 4 lines for the few making over $350,000. Are the wealthy already taxed enough? In some cases, yes. In fact, the average Maine household in the 95th to 98th percentile pays more than average already. That is why LD 1113 proposes an individualized equalization test, only for those in the top 1 percent. The questions LD 1113 poses to you are politic, economic and moral. Politically, a Maine Buffett Rule is supported by 4 in 5 voters. A national Buffett Rule is supported by Maine’s entire tripartisan Congressional delegation, including Senator Susan Collins. Can we stand with Maine people and with our entire U.S. delegation- or can’t we? Economically, research shows that fair taxes assist growth. When the struggling full-time worker has a little more money in her pocket, businesses like mine have more customers. Work is rewarded and productivity increases. Do we want a thriving economy and middle class- or don’t we? Morally, Maine people have always believed that we should each do our fair share, as we are able. Yet at present, our overall code is very unfair. Will we be the Legislature that asked each Mainer to do their fair share- or won’t we? With your leadership on this issue, I believe we can, we do, and we will. The Senate early Thursday morning failed to pass a Buffett Rule for Maine that would have restored revenue sharing for communities and provided tax breaks for the middle class. “We have yet another situation here where the House has done good bipartisan work only to see it undermined by the Senate,” said Assistant House Majority Leader Jeff McCabe of Skowhegan, a cosponsor of the bill. Starting in the two-year period beginning July 1, the measure would add approximately $75 million to the revenue-sharing system between the state and municipalities, thanks to an amendment from Rep. Michael Carey, D-Lewiston. The governor’s budget would have eliminated revenue sharing, but the bipartisan budget passed by the Legislature would restore two-thirds of it. The amendment from Carey, a member of the budget-writing committee, fully restores revenue sharing to its current levels. Here are the remainder of the videos from the House floor debate, in order of speakers.